The start of May this year brought warmth – 80F temps for the first three days. Leaves unfurled, flowers bloomed, frogs, toads and birds sang. Over the month we heard peepers, American toads, then wood frogs. All sorts of birds swooped in: bluebird, goldfinch, robin, phoebe, cardinal, chipping sparrow, and scarlet tanager. The hummingbirds returned to our land on May 11. Ah, Spring! For all these creatures May is time to get to work, and the same goes for us. I started another round of seeds using a commercial seed starting mix after March’s poor results. It was too late for some crops, but the real heat lovers like eggplant and tomatoes I start around this time anyway. They did well. I think that I both over-fertilized and over-watered in my previous attempts this year. So, I haven’t found a homemade mix to rely on, but I have a better idea of what the issues are that I need to address. Steve’s incubator worked! We had 12 chicks hatch and all are happy in the brooder on our porch, growing amazingly fast. We’ve set up another round, this time duck and chicken eggs. Once I flipped the calendar to May, I knew that Lily was due to kid soon, so we began our constant watch and worry vigil. Back in the fall, I had trouble getting clear on when she conceived, or if she definitely did. This was our buck’s first real test and I worried that he wasn’t getting his job accomplished. By April, I was sure she was pregnant, I just couldn’t predict exactly when her due date was more precisely than early to mid month. We set up the baby monitor in the barn, which is better than having to sleep out there, but still disturbs my sleep. 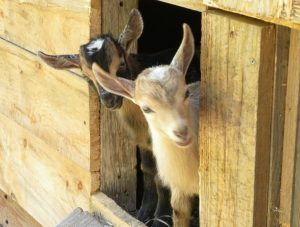 Even when not giving birth, the goats make noises – chatting with each other, chewing loudly, scratching themselves against the walls, head-butting. Every time I had to leave for previously scheduled commitments I rushed back as soon as I could. While goats rarely need any assistance with birthing, you don’t want to miss the one time they do. To add to the anxiety, this spring there has been a bear killing and eating goats not far from us, so I wanted to be sure to clean up any birthing fluids to not further risk attracting it. Luckily for my own health, she didn’t make us wait too long, giving birth in the early morning hours of May 6. Now that we are a few weeks out, I can calmly tell you that it was a perfectly normal birth, everything went just as it should, and she produced beautiful twins, a buckskin boy and a chamoisee girl! She cleaned up the kids within 5 minutes with minimal help from me with my towel, they were standing 5 minutes later and had figured out how to nurse in another 15. She’s a wonderful mom and giving lots of milk (most of it going to the kids at this point). If you’d asked me days after the birth I would have said all that, but I would have had much more to say about how completely exhausting and taxing it was – for me! 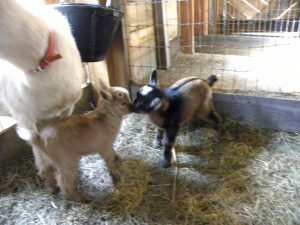 At the time of the birth, we also moved all the girl goats into the new barn. This again stressed me out more than them I believe. Many tweaks were needed to get the new systems working smoothly but I am now happily milking there, more comfortably than in the previous space. Our chickens are enjoying their jungle of a yard and the long days outside. Egg production has dropped, though, because 5 of them have gone broody! Which means they have decided to try to incubate eggs rather than lay them. We are not set up to allow this many broody hens to raise chicks. We haven’t decided how to handle all of them yet. Likely, when this incubator batch hatches we’ll set up at least one of them with some hatchlings. No, she won’t care that they aren’t from her eggs or even ones that incubated under her. She’ll be raising chicks and that was her goal. This is a time of year when I so appreciate our ducks. They are out all over our land every day eating slugs, mosquito larvae and hopefully ticks. Their eggs have deep orange, nearly red yolks, but not having to pick off slugs from my plants is alone worth all the feed they need to eat! We did finally find our missing duck from the winter. Down in the swampy area was a skeleton with a red leg band. We could see nothing from her remains that indicated a predator attack after all. She likely had an illness and went off by herself to die. That’s not unusual in many species, possibly evolved to protect the rest of her flock from what disease she had. We are happy to feel clearer on what happened and grateful the rest of them continue to thrive. 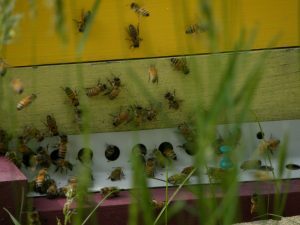 The new hives are off to a fine start, drawing comb, bring in nectar and pollen with productive queens. Their personalities are on the cranky side, though, causing me to need to put on gloves and light my smoker every time I check on them at all. When my new northern-bred, Russian queens arrive from Cold Country Queens in about a month, rather than make spits I might simply re-queen these to have some safer hives to work in and around. At the start of the month, although air temps were high, soil temps were not. There are not many crops that appreciate being planted into cold soil. 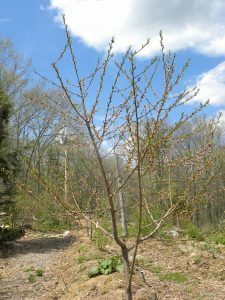 I have often tried to stretch the season by earlier planting and seeding outdoors, but without great success. My March and April root crop seedings don’t germinate well even with all the great rain keeping them moist, and even hardy seedlings like kale and broccoli just sit there doing not much until it gets warm. 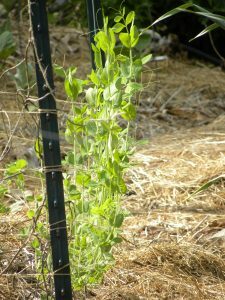 Tomatoes, eggplant and basil lose ground if planted too soon. We were heading into the third week of May when conditions became good and we really got to planting… and planting and planting! I would have liked to get it all in the ground in just a day or two, but the realities of energy levels and back pain don’t allow for such an overly-ambitious, possibly insane plan given the current size of our growing areas. This year, I am working harder on record keeping, in part to be able to share here. I still need to work on getting even more specific, but I can give you a fairly detailed report. 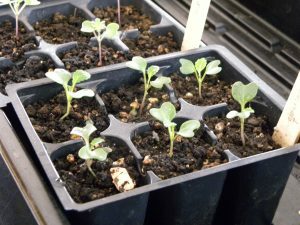 I started off mid-May by planting 30 brassica and 15 lettuce seedlings. A few days later, with Steve’s help, we put 12.5 # of 5 different varieties of potatoes in. I then moved to seeding, first 33 locations for winter squash (about 4 seeds per spot, 6 varieties), and 6 for 3 types of summer squash and a dozen sunflowers. 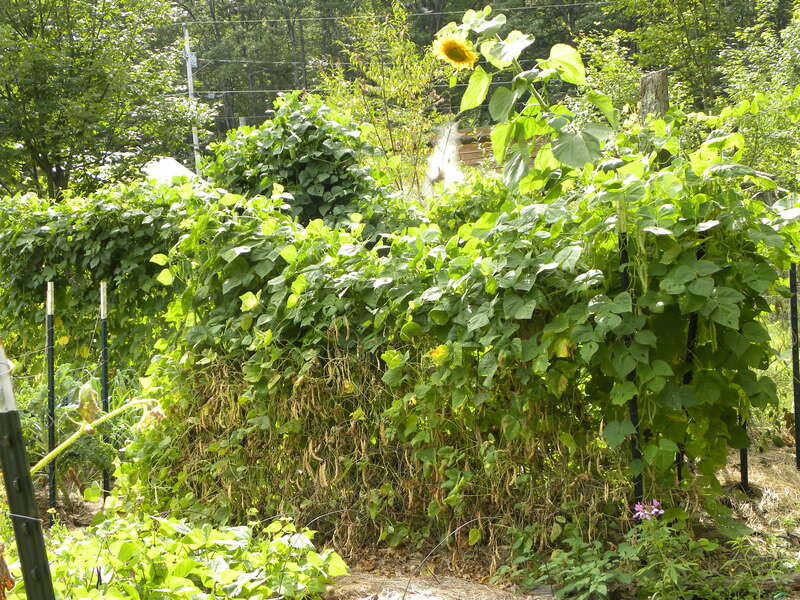 The same day I did a bed of bush bean seeds of 3 varieties, 3 dry bean types and a row of 10 cucumbers. My next planting session I transplanted leek and onion seedlings, celery, parsley, more beans for drying and 5 varieties of tomatoes. I started seeding root crops, too. I had put those off because they are demanding for even a healthy back and I’ve been dealing with pain for a few months. But, it was time so I carefully got to it with parsnips, carrots, beets and radishes. Those seeds took me a few days, a little at a time, to get through. Corn, both Tom Thumb popcorn and Abanaki Calais Flint corn went in after that. My eggplant and basil should be in during the first few days of June. We also completed some more garden bed areas with sheet mulch and hugelkultur techniques, which I seeded with more winter squash, sunflowers and beans. 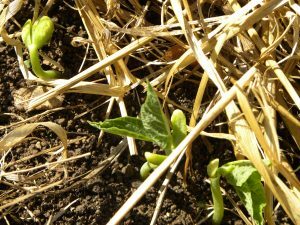 I’ll continue with successive plantings of beans and root crops for the next couple of months. Now we hope for appropriate weather including precipitation, and not too much predation by our local wildlife! Our perennial crops have a real head start on any of the annuals. 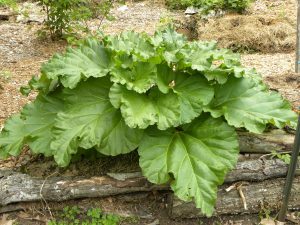 Examples of these are rhubarb, asparagus, nettles, and herbs which we ate lots of in May. Many of our fruit varieties flowered this month and look to be set up for a productive season. The sheet mulching and hugelkultur bed making also took some of our time – gathering the materials from off-site especially: manure, wood chips, seaweed, mulch hay and cardboard. We brought in 176 chicken eggs, 132 duck eggs, and 6.8 gallons of milk. I continue to make cheese and yogurt with the extra milk coming in. Outdoor harvest has started. We picked 7 pounds of rhubarb, 3 pounds of nettles, and lots of pinches of chives and oregano. There are still canned fruits, frozen and dried veggies. Our solar production was down from other years because of how many cloudy days we experienced (no, it wasn’t your imagination, it really was another grey month!). We made 614 kwh, which covered our needs and did start adding to our credit line with the power company that we’ll draw from during the shorter days of winter. Everything will grow! What look like empty garden beds now will fill in, animal babies will be teenagers and I’ll be fighting back some plants threatening to overwhelm their neighbors. Great abundance expected! Here at the end of March it is starting to feel like spring, but most of the month was unmistakably winter, with four nor-easters hitting us over the course of the month. Although we didn’t love moving all that heavy snow or having the animals more confined, at least this puts us near the normal range for precipitation this year – no drought yet in 2018! 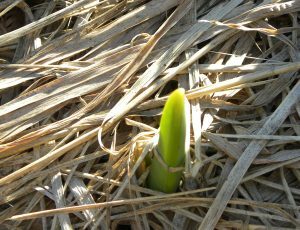 Signs of spring include: songbirds returning (a flock of bluebirds and another of goldfinches frequent our yard), buds swelling on the trees, perennials greening, and spring bulbs, including garlic, emerging. Indoor work continued this month, feeding the fire while starting seeds and making salt. We also stack other functions with the wood stove such as drying all our laundry next to it and doing cooking and water heating on it. I started leeks, kale, collards, brussel sprouts, lettuce, and eggplant. Germination seemed slow at first, but is finally taking off. fruits well. The grapes continue to confuse us. They just never seem to look like they do in the books once we get out there! I expect that the more we do this and watch the results the more we’ll gain understanding and confidence. The winter can be hard on our fencing, with snow load causing collapses, branches falling and animal incursions. 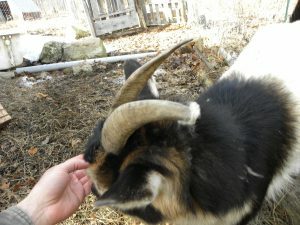 Steve had repairs to do, then another line of fencing to add for another goat pasture. 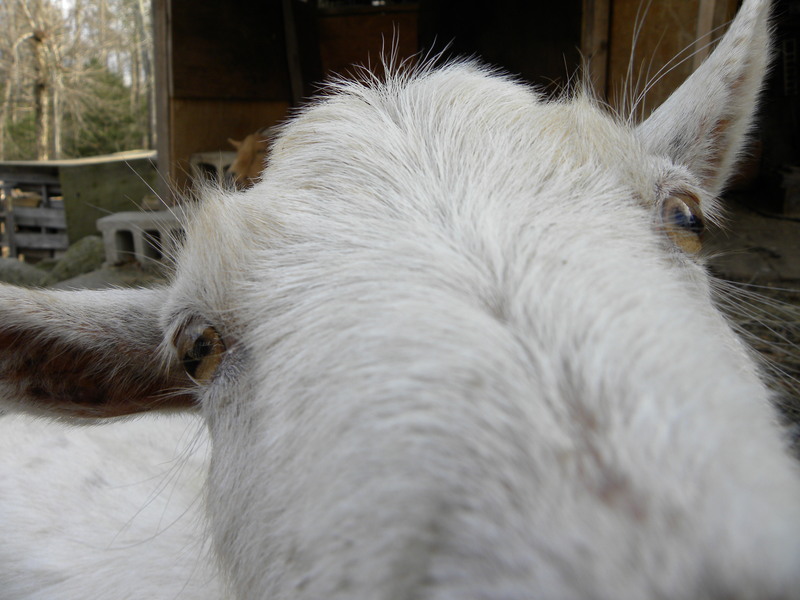 When we started with goats, we never intended to keep bucks. I planned to rent them for the breeding season. Now that we do have our own boys, we needed an appropriate area for them. The new barn has a stall for them and there is now a large, well-fenced area for their yard that shares no fence line with the females. We don’t have a rotation system for them in place yet, but we can add that. Their pasture is actually a young woody, brushy area with very little grass which means it will be slow to cause a build up of parasites for them. Off-farm I spent time connecting with people in meaningful ways, on issues that matter to me. This felt especially important since my March reading included The Village Effect by Susan Pinker. It presents fascinating research and stories about how crucial and healthy it is for people to come together. I led a Spring Equinox circle dance, a performance of my frame drumming group, and an extra storytelling workshop focusing on immigration. I was happy to teach about soil building to an enthusiastic group at the NOFA-NH Winter Conference and hear other great speakers and teachers, such as Dr. Daphne Miller. 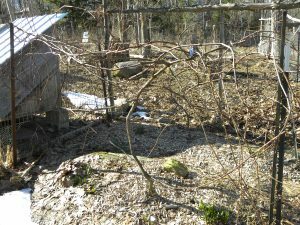 I put in extra time with NH Peace Action and Seacoast Permaculture as well. 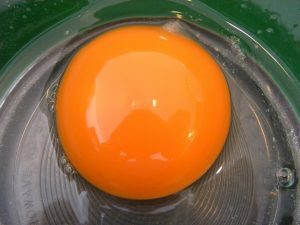 Check out that deep orange egg yolk from our ducks! We continue to get the most from our animals rather than plants at this time of year. We brought in 241 chicken eggs, 119 duck eggs, and 5.2 gallons of milk. It’s a high production time for the poultry, but a low season for milk. Usually we breed for kids in April, but Lily’s due date is in May this year. 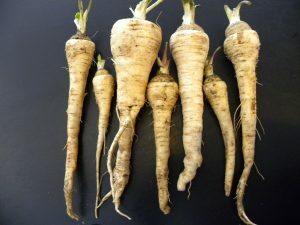 When we prepped the green house for planting, we discovered a crop of parsnips! These had seeded themselves last year and didn’t seem to be growing many greens, however they made these nice roots for us. I think we’ll try that on purpose this summer into fall. Our shelves are getting barer. We finished the winter squash and carrots. We have enough potatoes left for one more good meal. We only have a few more birds in the freezer. Canned fruit and jam remains, as does dried beans, dehydrated kale, and popcorn. The salt making has been a lot of fun. I have about 3 quarts, plenty for daily use and lacto-fermenting. It inspired me to start reading Mark Kurlansky’s book Salt: A World History, which I’m enjoying. March is a great month for solar gain. The sun has moved higher and stays up longer, and the trees haven’t leafed out yet. We made 435 kwh from our PV solar panels and had quite a few cold but sunny days when we didn’t need to start the wood stove until after dark. The animals gain some heat, too! 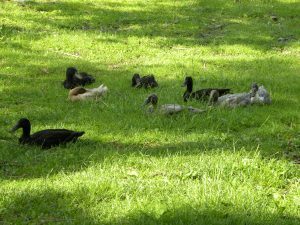 We also have a loss to report this month… our duck flock shrunk from 9 to 8. One of the girls just disappeared. We searched, but the ducks cover a very large area so we definitely could have missed a dead one. We suspect, though, that a raptor took her. We’ve been on the lookout for other predators or issues but haven’t seen any. As long as it’s not a pattern that will decimate the flock we are willing to humbly accept small tithes to the other creatures who also have a right to live here. Still – I do love the ducks and was sad to lose one and really worried about those left. We could confine the ducks more for better control and safety, but we get so much more out of them this way for now, we’ll take the risk and let the ducks be ducks (as Joel Salatin might say). 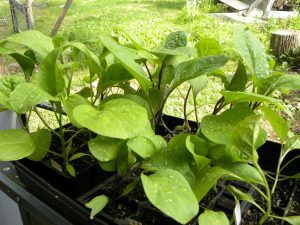 We’ll start many more seedlings, and even plant outdoors. 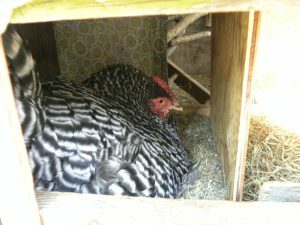 Egg incubation is planned, including some under an already broody hen. My new packages of bees are due to arrive April 8. I’ll be hoping to wrap up some indoor work, including getting most of Seacoast Permaculture’s events through the fall scheduled. As weather permits, we’ll be outside more and more, hoping that our winter work set us up well for a productive season. Juniper is Shedding – see her horn tips! Another winter month on our homestead has passed. 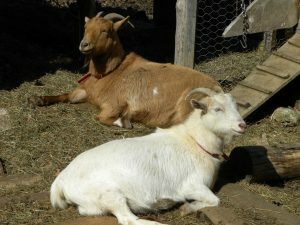 It was unusually warm for February, with more rain than snow falling, leading to a mini-mud season, shedding goats and flying bees (video of the bees: Bees Flying – February Thaw 2018). But the days were still short, it’s not spring yet. Taking care of livestock happens every day, in every season. Feeding, watering, keeping their bedding fresh, watching out for health problems. 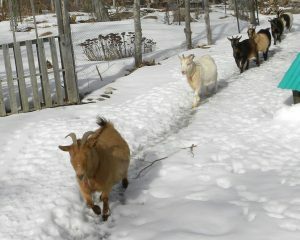 Without much snow, the animals had a larger area, venturing out into farther yards. There isn’t much for them to eat out there, but I like it when they can get out and not spend so much time in one area, standing in their own poop. 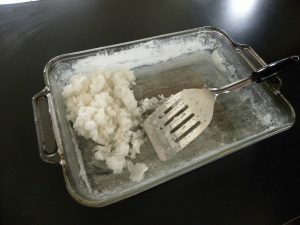 I have a new project that I am loving – making our own sea salt! When we collected seaweed for the animals recently, we also filled some buckets with water. I ran the water through a strainer to remove bits of seaweed and sand, then put that water in an open baking dish on our wood stove. Evaporating two gallons per batch, I’ve been thrilled at how much beautiful salt we are ending up with! Doing this on the wood stove means that I am not using any extra energy, and we are getting a humidity benefit as well – stacking functions! I had a surprise task of honey harvesting this month. After bringing in the dead hives I found last month, I found more honey than I needed to get bees started in the spring. I decided to do an extraction now before the honey started to crystallize, which makes in harder to extract. It’s a sticky job, but so satisfying! At the end of the month I started my first seeds indoors. Leeks and onions need to get going this early in our area if starting from seed. My onions have been disappointing in recent years, but my leeks have been fabulous, so I am focusing on them this year. I chose the variety Lincoln and have a flat of 100 seeded, hopefully germinating any day now. 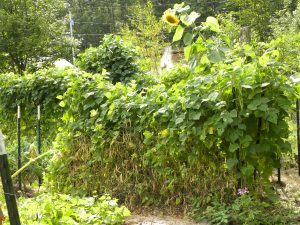 I’ve been able to attend great films and workshops through our local permaculture group, exploring a range of topics including: complementary currencies, urine diversion to farmland, and social permaculture. I’m also trying to set up our calendar of events through the summer so I won’t have to do so during the growing season. I’m taking an online class about natural goatkeeping and kidding from Deborah Niemann, in preparation for our own kidding season. 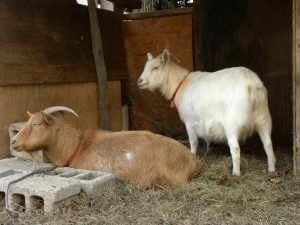 We have one pregnant doe, Lily, my favorite goat, who is due in mid-May! My reading list is no where near done, but I have sent a lot of postcards to my representatives on many different issues. Egglaying really kicked in this month, with 156 chicken eggs and 34 duck eggs collected. Even with so little forage, the duck egg yolks are a deep orange. Milk continues to just trickle in. After 2 1/2 years in milk, Lily was “dried off” because of her pregnancy. She really led the process. Before initiating the dry off myself, her supply just dropped off to almost nothing over a couple of weeks. Her body knew what to do! We did get 5 gallons this month, enough to keep making yogurt, which is the most important dairy product to me. My salt making yielded 2 cups of salt in February. It’s delicious – extra strong salt taste for some reason. It should last even longer because we won’t need to use as much of it. The winter honey extraction yielded 20 pounds. Steve ate about a dozen lemons from his little potted tree in the living room. We continued to eat from last year’s preserved harvest. We saw the end of our parsnips, dehydrated beans and grapes. All other supplies are holding out. Our wood supply remains abundant, and our solar panel gain grows with the sun. In fact, I took some notes so I can tell you that we made 217 kwh of electricity this month. March should be much better. We also started capturing another resource on the farm: our urine. I know, I know – ick, you probably say. But, let’s get past that and look at some information. We had an amazing presentation by Dave Cedarholm, the founder of Pee Local in NH based on the work of The Rich Earth Institute. We learned about the terrible effects of excess nitrogen running into Great Bay, a significant percentage of it from human urine. Wastewater treatment plants are undergoing expensive upgrades to try to remove the nitrogen, and typical home septic systems do nothing to remove it. 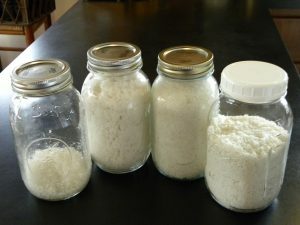 However, if it is captured by itself rather than mixed with other waste, it is a safe, effective and cheap fertilizer. 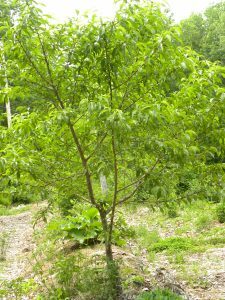 Applied to growing plants and active soil, it is happily and appropriately used. This is a perfect example of our permaculture tenet to Turn Problems Into Solutions as well as Principles 5 (Use and Value Renewable Resources) and 6 (Produce No Waste)! 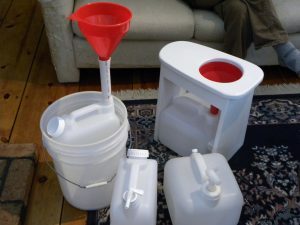 So, we are collecting and storing our urine for use during the growing season. Steve is learning to make “sitz-pees” that make it easy for women to do so, since we don’t yet have commercially made urine diverting toilets available in the US. I can tell you that it felt weird to use for about 3 days, and now I can’t imagine doing anything else. I feel bad when I have to use the bathroom away from home to be wasting this resource! 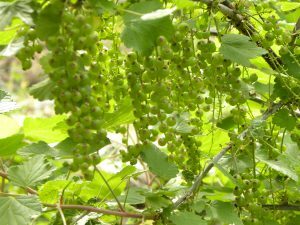 February is behind us and coming up in March, I will start many more seeds, prune our trees, bushes, grapes and brambles, keep making salt, and we’ll see what else comes up!